Northern Iowa guard Paul Jesperson gestures to fans after hitting the game-winning shot against Texas in a first-round men's college basketball game in the NCAA Tournament, Friday, March 18, 2016, in Oklahoma City. These days, you may hear people in the United States talking about March Madness. Does the month of March make people angry? The competition takes place every March. And the madness it creates is excitement! The three-week long college basketball tournament is exactly that. It involves 64 men’s team and 64 women’s teams from colleges and universities around the country. Another reason for the madness is that people bet a lot of money on the games. In 2015, the American Gaming Association said about $9 billion is bet on the tournament. That is more than double the amount bet for the professional American football championship known as the Super Bowl. All that money is enough to drive someone crazy! The National Collegiate Athletic Association, or NCAA, puts on the basketball tournament. The competition is made up of three divisions. The men’s Division I tournament is the most popular. It features players who sometimes move on to professional careers in the National Basketball Association, or NBA, and other leagues around the world. Some of the players who became famous in the NCAA tournament and now have major professional careers are Carmelo Anthony of the New York Knicks and Dwyane Wade of the Miami Heat. Retired NBA legends Magic Johnson, Larry Bird, Patrick Ewing and Michael Jordan all played in the NCAA tournament. Even tournament players who do not “go pro,” sometimes become folk heroes for the fans that support their teams. Paul Jesperson of the University of Northern Iowa is an example. He will be famous in his state forever as a result of his game winning score in the tournament just a few days ago. Jesperson threw the ball from half-court with less than a second left in play. The crowd went wild when the ball went in the basket. NCAA experts choose the teams to play in the tournament each year. When a team loses a game, it leaves the tournament. The tournament goes from 64 teams to 32, 16 and 4. The last two rounds are referred to as the Sweet Sixteen and the Final Four. This year, the championship game will be played on April 4. Some of the recent men’s tournament champions are Duke University from North Carolina, the University of Connecticut, and the University of Louisville, in Kentucky. 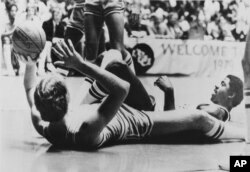 The tournament has been going on since 1939, but did not become a “madness” until 1979. That is when Michigan State University defeated Indiana State University. Two important players faced each other in competition: Michigan’s Magic Johnson and Indiana’s Larry Bird. Both went on to the NBA and great fame as two of the greatest basketball players ever. The university with the most tournament championships is the University of California, Los Angeles, or UCLA. The Bruins, as the team is known, has won 11 times. After this weekend’s games, the tournament will be down to the Final Four. Some of the well-known teams still playing are Pennsylvania’s Villanova University, the University of Kansas and the University of Oregon. One of the most interesting stories in this year’s tournament came from Yale University, a school better known for academics than athletics. Yale qualified for the tournament by winning the Ivy League for the first time since 1962. The league also includes Harvard University and Princeton University. The games are usually exciting, adding to the madness. Even the players are big fans. Daniel Ochefu plays for Villanova. His family is from Nigeria and he lived there for a couple years when he was a teenager. He says great things happen in March. Of course, when great things happen, that is when the madness ends. Dan Friedell wrote this story for Learning English. Caty Weaver was the editor. Do you follow the NCAA basketball tournaments? Who are you rooting for? Write to us in the Comments Section or on our Facebook page.